In addition, after globally distributing major electronic brands such as JVC, Sharp, Panasonic, AIWA and Toshiba for many years, in 1999 the company developed their own brand called "Gotech". Already, Gotech has established itself as a highly reliable name in the consumer electronics industry. Consumer Electronics and Appliances: Since The Group was founded on electronics the company decided to concentrate its efforts in this industry. With the support of its global relationships and satisfied customers, The Group developed their own brand name: "Gotech". A highly experienced development team considered design, reliability and cost prior to going into production. The Group launched the Gotech line to meet the demand of the world market. Currently, Gotech audio and video products include: TV, DVD, CD Boomboxes and Microwaves. All of which are highly regarded in the industry. In 1998, HKG Duty Free was formed to service US Southern Border customers crossing daily into Mexico. In 2009, the flagship El Portal HKG Duty Free store was opened in Laredo, one of the largest land border crossings in the US, processing over 15 million people each year. 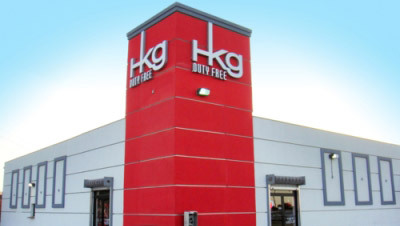 HKG Duty Free has expanded operating eleven store locations positioned along the US Southern Border: three in California, one in Arizona, and seven located in Texas. HKG Duty Free is the market leader in electronics, but also now developing comprehensive fashion brand portfolio including Mont Blanc, Fossil, Michael Kors, A/X Armani Exchange, Diesel, DKNY, Adidas, Guess, Tommy Hilfiger, Casio, and Lacoste. Also, HKG Duty Free offers wide array of famous fragrance brands launching new programs throughout the year. In addition, popular international and domestic spirits and tobacco brand are offered tax free for export in all HKG Duty Free locations. Moving south, HKG recently acquired two stores located in Belize offering the same brands and categories to customers crossing into Mexico. Coming soon, HKG will introduce its first Duty Free Store opening in Queretaro International Airport, Mexico.